my bare cupboard: Hokkaido 3.7 % milk loaf / mini cheese and sun-dried tomato pesto rolls ( using a Tangzhong starter ) "
I've been eyeing the recipe of this bread for quiet sometime at Christine's Recipes' blog . Months ago , I kept checking out the local library's online catalogue whether there's a listing of the popular book by Yvonne Chen . Nothing then but when I checked again last week , there are more than 10 copies of the book ! Sadly , no bilingual edition of 65° Bread Doctor , so I had to check Christine's blog for reference . This bread is really popular to all bread loving bloggers since the book came out years ago . 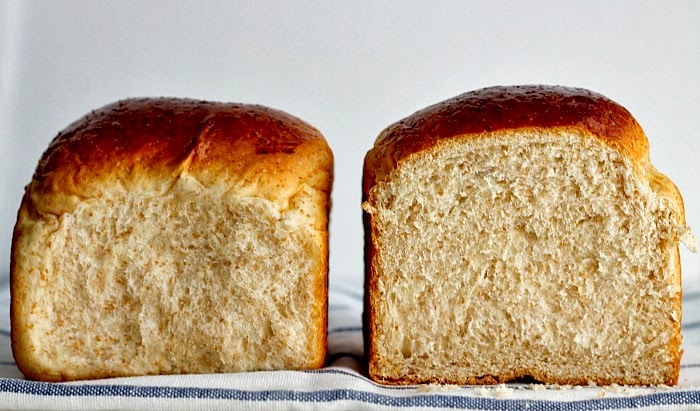 With soft and fluffy texture , bread that will stay soft for days - this bread owes its texture and height to the method called Tangzhong . Well , the name of the bread itself comes from Hokkaido milk , one of the ingredients in making this bread . Hey , any milk will do ! I was quiet hesitant at first to try this recipe since the dough is quiet wet . I'm only using elbow grease when making breads , so I use my tried and tested method to combat the sticky dough . 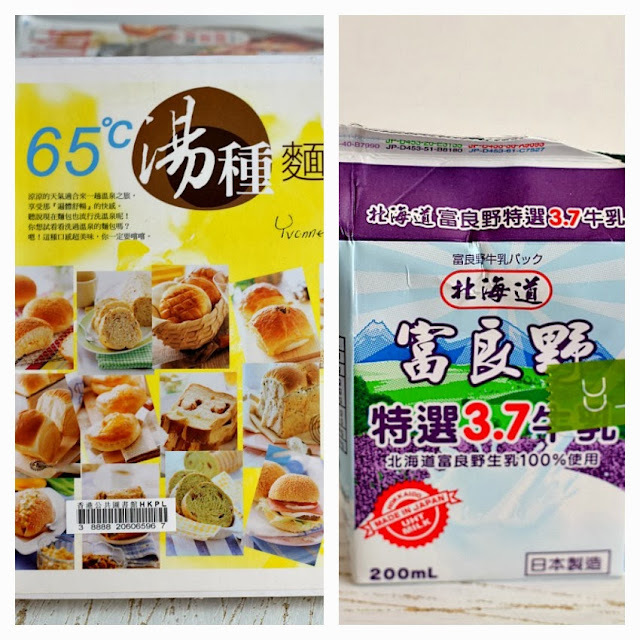 Last time , I went to buy a loaf of bread in one of the bakeries here and saw Hokkaido 3.6 % milk loaf . The percentage is a reference to the fat content of the milk , the higher the percentage the creamier the milk is . Most whole milk has 3.6 % fat content . I seldom buy UHT milk produced in Japan since it cost double than the ones we have here in Hongkong . But when I saw the loaf bread from that bakery , I immediately check the newly-opened Japanese supermarket near us to check their milk products . Yup , I've seen 3.6 % milk but there's 3.7 % milk as well . 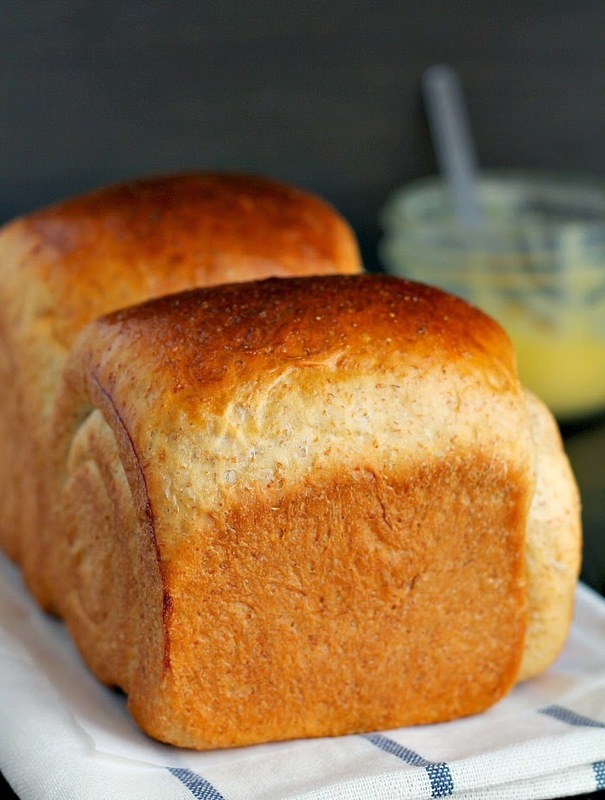 Have you baked bread lately ? Oh , my secret to combat a very sticky dough especially when kneading manually ? Using some whole wheat flour , not a secret , mind , but it works for me . Tangzhong :: In a small saucepan , put 1/3 cup / 50 grams of bread flour and gradually pour 250 ml water , stir until flour is thoroughly absorbed . Turn on heat and cook over medium heat , stirring constantly , until mixture thickens . Once you noticed some lines appears in the mixture as you stir it , that's your Tangzhong or use a thermometer , when it registers 65°C , it's done . Let cool before using . * In a large bowl , combine the first 5 ingredients , use a whisk and mix thoroughly . . Make a well in the center of the mixture and pour the remaining ingredients . Use a wooden spoon or your stir with your hands until it forms a cohesive dough . Transfer dough to the work surface , knead until smooth and elastic , at least 15 minutes . Put dough into a lightly oiled bowl , turning once to coat and cover tightly with plastic wrap . Let rise for at least an hour or so , depending on the warmth of your kitchen , until tripled in size . * Tip in dough onto the work surface , knead for few seconds and divide into portions , cover and let rest for 15 minutes . My final dough is 1040 grams , 530 grams for the loaf bread and 510 grams for the mini rolls . For the loaf : Divide dough into 2 portion , 265 grams each , with a rolling pin , shape one portion into a long rectangle shape , on the long side , fold about 1/3 of the dough from the top edge to the middle then fold 1/3 from the bottom edge to the middle and seal and using a rolling pin roll to flatten dough and shape into a spiral , place into a lightly greased 8 x 4-inch loaf tin . Repeat with the remaining dough . Cover loaf tin with a plastic wrap and let rise again for at least an hour or until it reaches 80% of the pan . * Meanwhile , preheat over at 180°C . * Bake loaf for 35 minutes and the minis for 25 minutes . * Serve warm or at room temperature . I love the rolls-they look really tasty! Love both of your hokkaido bread. The rolls sounds great with that yummy filling. Can i drop by pick up some later?? Perfect! So soft that I can't believe it has high ratio of wholewheat! I love the way you explain everything. Makes baking so interesting. hi anne! you actually can read chinese? had tried the same recipe during one of our bake along..tho i did not use hokkaido milk ..and very happy with the result. Your mini rolls looks gorgeous, not to mention that they are sure tasty as well ! have a good week! Usually I buy it from the bakeries because I don't think I can make it. You have done an amazing job because the visuals are the proof of it. After baking Christine's Hokkaido loaf, I have good faith in her Tang Zhong bread recipes too. 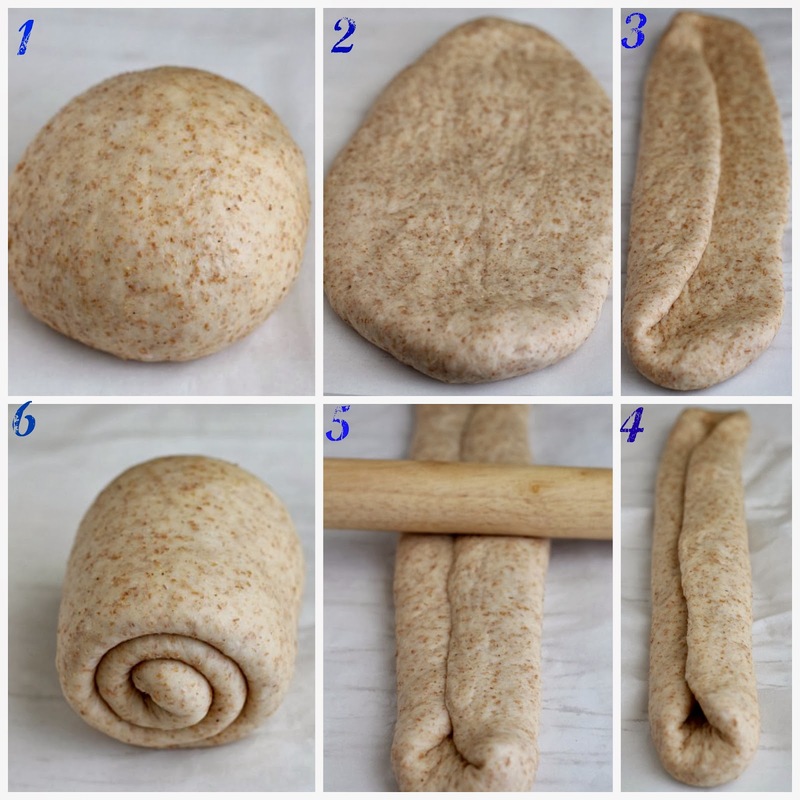 Do you think it is possible to make this bread in a bread making machine? I totally swear by Tang Zhong as well. Your pesto filled rolls are so tempting. Wow, lovely breads! I have never tried Japanese milk before, does it really makes a lot of difference in the bread? How I wish the books are in bilingual! I get very frustrated when I see books like this, there's also some books from Carol (a wonderful baker), which are not bilingual. I actually sent Carol an email asking her whether will there be future books printed in bilingual languages, but she says she has no say in this, it is up to the publisher to decide! I'm interested to get the book by the bread doctor too, let's keep our fingers crossed that there will be a future bilingual edition very soon! LOL! Hi Anne, thanks for sharing your secret, a very useful tip. 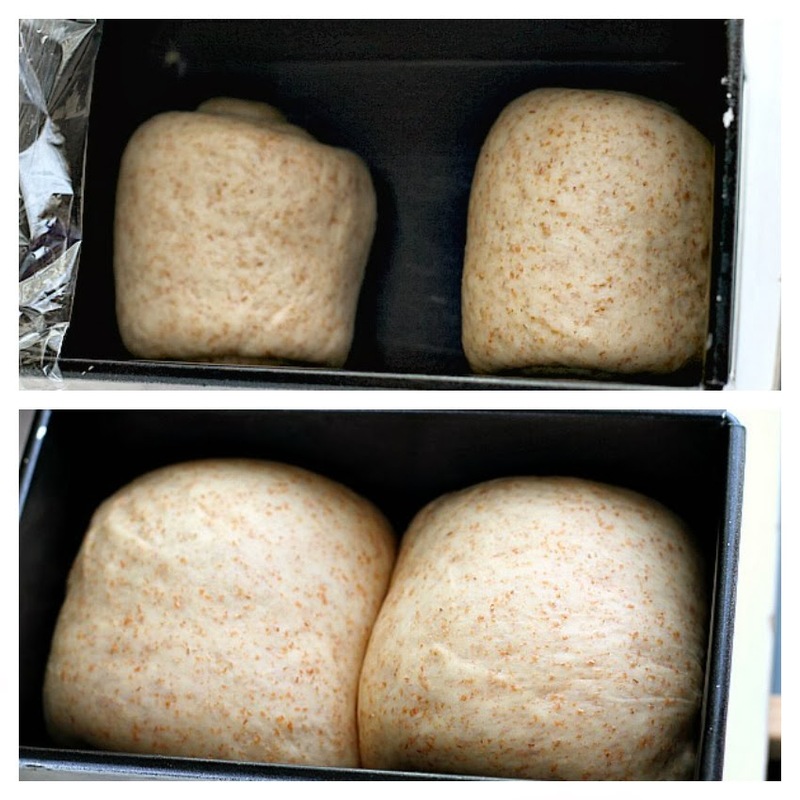 Apart from making the kneading easier, it makes a healthier loaf. And noticed that you omitted cream too. I have been wondering for awhile if hokkaido loaf will be as soft without cream but have been too timid to try, your results have proven it's possible. Thanks for sharing this Anne! And those rolls look so good too! Hi Anne, I finally found some time to visit after a short break:D Can I come visit you the next time I am in HK? lol! then I can savor some of your delicious looking bread!